Former GB&NI representative and British 24 Hour Champion (1999) Adrian Stott, the manager of Edinburgh’s Run and Become, is one of the most experienced ultra marathon competitors in the UK. His exploits include running the 95 mile West Highland Way race on eight occasions and finishing eighth in the European Championships 24 Hour event (2000). The London to Brighton race, organised by the Road Runners Club, was the classic point to point ultra road race. Starting at Big Ben on the first stroke of the 7 a.m. chime, runners went from the heart of the metropolis through the suburbs, and out into the countryside, continuing over the North and South Downs to finish on the seafront at Brighton. Since 1951 it had attracted not only the top British ultra runners but also the top Americans and South Africans. It had long been thought that if a leading marathon runner were to have the courage to tackle the 53 miles of the Brighton, he would do well. Step forward Aberdonian Alastair Wood, a GB marathon international with a PB of 2.13.45. In the 1972 race he not only demolished a good class field but broke the course record by running 5 hours 11 minutes exactly. Sadly, due to increasing traffic and organisational issues, the event was last held on the roads in 2005. Wood was to inspire another Scot who would leave an ultra legacy for years. The quiet unassuming Scot is quite simply an ultra distance legend and a good club runner at distances up to the marathon (PB of 2.19) and his achievements of the late 1970s and early 1980s are still revered the world over. Inspired by fellow Aberdonian Alastair Wood, Ritchie decided to attempt the classic 55 mile London to Brighton Race as well (1977) and duly beat England’s finest. 100 km (62.2 miles) was starting to be recognised as the international standard ultra distance by which performances could be compared. The Road Runners Club (L to B organisers) thus organised a 100 km race at Crystal Palace track in South London (250 laps) in October 1978, inviting Ritchie and other top British runners of the time like Cavin Woodward and Tom O’Reilly. Ritchie produced what was probably his best ever performance to smash the existing world 100 km record with 6 hours 10 minutes 20 seconds (average pace 5.59 per mile). Despite efforts by top Japanese and European ultra specialists, this is still the best time ever recorded for the distance 35 years later!! In 1987 the International Association of Ultra Runners (IAU) established a World 100 km Championships. In the inaugural event Don Ritchie, probably with his best years behind him, achieved a silver medal. In 1994, Trudi Thomson (Pitreavie) having established herself as one of Britain’s best, had the race of her life to take the silver medal at the World 100 km Championships held at Lake Saroma in Japan. She recorded 7 hours 42 minutes 17 seconds, which still stands as the current Scottish record and third best on the UK all-time list. In 1999, Scotland went one better when Simon Pride (Keith and District) stormed to the gold medal at the World 100 km Championship at Chevennes-en-Pallier in France, recording 6 hours 24 minutes 05 seconds. Living only a few miles from Don Ritchie in Moray, Pride had been inspired and guided by the training and racing attitude of his illustrious compatriot. In an exciting last 10 km, he prevailed over the Frenchman Thierry Guichard by a mere 21 seconds! His time is still a Scottish (and GB) road record. In 2008, by way of encouraging Scottish athletes to gain qualifying performances for the inaugural 2009 Commonwealth Ultra and Mountain Running Championships, an ultra festival featuring the two championship distances of 100 km and 24 hours was held at the North Inch park in Perth. It was the first time in the UK that both championship distances had been staged simultaneously within one event. Carnegie Harrier Pauline Walker stole the show by setting three Scottish ultra records, having run steadily to reach 100 miles in 17 hours 12 minutes 22 seconds at almost 3 a.m. in the morning. She then pushed on relentlessly to make the most of the near-perfect conditions to surpass her existing record at 200 km (124.5 miles) in 22.48.28 and for the 24 hour distance of 130 miles 607 yards. Although Ritchie’s 100 km record is the ‘Jewel in the Crown’ of his achievements, his legendary status is well worthy of a second mention. Although not realised at the time, he is now generally acknowledged worldwide as being pivotal in pioneering modern ultra distance training which, accompanied by his modesty but total self-belief and determination, led him to break the listed ‘World Best Performances’ at all distances from 30 miles up to 200 km. The World 24 hour mark was the one major record that eluded him, though to be fair he did lower the World 200 km mark on three separate occasions in 24 hour races. His first 200 km record was in some ways the most memorable as it was the only world best performance he managed to break in Scotland. This, in true Ritchie tradition, was achieved at an event, organised by your writer, at Coatbridge track on a very wet October weekend in 1983. The wind was so strong it kept blowing over the trackside leaderboard. Andy Milroy, the renowned ultra distance statistician, when asked in 1999 to name his ‘ultra runner of the century’, fittingly nominated the quiet Scot from Lossiemouth. Noremac was the name adopted by Edinburgh runner George D Cameron who, well over 100 years ago when ‘Pedestrianism’ flourished, was one of a number of Scots who, fuelled by prize money and public fascination, took part in multi-day events up to 1000 miles in duration. In the 1870s and 1880s events from 6 hours to 1000 miles were staged on small indoor tracks. The Herald’s Doug Gillon in a more recent article captured the spirit of the events. “From the Pacific West Coast of America to Europe to New Zealand, thousands upon thousands of excited fans screamed themselves silly as they witnessed the sporting spectacle of the Victorian period. The sight of scores of rugged men dressed in an array of colourful costumes making their way around sawdust tracks for up to six days and nights, captured the hearts of the sporting public.” Behind all the outer show were talented athletes who trained hard to achieve some amazing performances and they were well rewarded with good prize money. At Madison Square Garden in October 1882 Noremac (Cameron backwards!) set what is still the Scottish Six Day record of 567 miles (+ 4 laps). Scotland’s iconic long-distance footpath on one mid-summer weekend hosts the longest event to receive a permit from Scottish Athletics. For most readers, walking ‘The Way’ in a sensible timescale like a week, with overnight camping or B&B is probably what comes to mind. The West Highland Way Race gives you 35 hours to travel from Milngavie just north of Glasgow through varied terrain to Fort William. 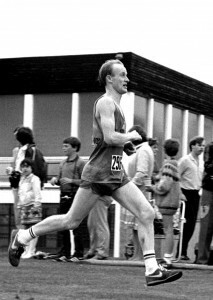 Bobby Shields and Duncan Watson, two of Scotland’s most experienced hill runners of the time, challenged each other in 1985, taking 17 hours 48 minutes and 30 seconds. Their legendary exploits have been repeated now by over 500 people of all standards and the event attracts ultra runners from around the world. The current race records are held by Englishman Jezz Bragg who ran 15 hours 44 minutes and 50 seconds in 2006 and Scotland’s Lucy Colquhoun who ran 17 hours 16 minutes and 20 seconds in 2007. While most walkers dream of completing the Munros (all the Scottish mountains over 3000 feet) in several years, if not a lifetime, hill runners have other ideas. The fastest recorded round of all the 283 peaks is apparently held by Charlie Campbell, a Glasgow postie, who between May 29th and July 16th 2000 ran, biked and swam (Mull and Skye!) all the Munros in 48 days 12 hours. Hugh Symonds set a record for completing the round completely on foot in 1990 with his wife and family in support. Unlike Campbell, he did not use a bike but did all the linking by foot, although he stayed relatively dry by rowing to Skye and yachting to Mull. Symonds was one of Britain’s leading fell runners of the time, and didn’t stop after his last Munro but continued on foot to the Lake District to ‘bag’ all the 3000 foot peaks, following that with all the Welsh 3000s. Only as an afterthought he took a ferry to Ireland to complete a remarkable journey through the highest Irish hills. In 1994 Mike Cudahy, another legendary ultra trail and hill runner, apparently having time on his hands when retired, undertook what is believed to be the fastest complete journey of the Munros completely on foot, one day faster than Symonds (66 days). He did however take the ferries to/between Mull and Skye. The exact distance involved of a continuous Munro round obviously varies, but Martin Moran records his winter round of 1984-1985 of being 1028 miles with 412,000 feet of climbing. By any stretch of the imagination, doing the Munros at speed is an impressive achievement. The Ramsay Round is arguably the toughest ultra challenge in Scotland for which records are kept. The Lake District has its Bob Graham Round, and Wales the Paddy Buckley Round. Phillip Tranter in 1964 established a 36 mile (19 summits) round of the Lochaber hills at Fort William. Edinburgh’s Charlie Ramsay planned and completed a longer, and far more demanding round of the Lochaber hills in 1978 by extending Tranter’s route to 56 miles with 24 Munro summits and a total of 28,500 feet of climbing. As with all these classic rounds, the idea is to do them in 24 hours! Everest in a day! Charlie, by his own admission, had to ‘fairly leg it’ down Ben Nevis, the final descent, to finish in 23 hours 58 minutes! To date, only 55 runners have completed ‘The Ramsay’. Compare that with the few thousand who have completed the Bob Graham to tell you how difficult a challenge it is. The current men’s record is held by Adrian Belton (18 hours 23 minutes) and the women’s record by Scottish and GB international Helene Diamantides (20 hours 24 minutes).